The Crain's Fast Fifty represents the fastest growing companies in Chicago based on five-year revenue growth. We're thrilled to score a Crain's Fast Fifty list three-peat! Maven Wave has landed the #25 spot on the Crain’s Fast Fifty list of the fastest growing companies in Chicago! This marks the third consecutive year that the company has been included on this exclusive list. Previously, Maven Wave was #6 on the list in 2015 and #2 in 2014. The Fast Fifty businesses have all achieved impressive gains over the last five-years and are ranked by revenue growth. Maven Wave has grown 469% since 2010, which has landed the company a spot on the list for the 3rd year in a row. Maven Wave fuses traditional consulting discipline with cutting-edge technology development to meet the changing demands of today’s enterprise. The company's solutions enable digital businesses by delivering strategic change that is rooted in analytics, built in the cloud, and available anytime, anywhere. Capitalizing on the evolution of technology trends and the digital transformation of business has driven Maven Wave’s growth. This growth is most visibly demonstrated by the success of their strategic partnership with Google; the Google transformation business has grown at a compound annual growth rate of nearly 300% over the last five years. Additionally, the User Experience and Design practice has grown at a CAGR of nearly 200% over the same period. "There's no question that the relationship between customers and vendors is increasingly a digital one. More than ever, winners and losers are being chosen based on the enterprise's ability to create design-centered technology experiences that meet the demands of digital natives at warp speed. We are uniquely positioned to benefit from this accelerating long-term trend," said Brian Farrar, Partner and a Founder of Maven Wave. "Steph Curry isn't the only one hitting 3's. We're thrilled to score a Crain's list three-peat!" 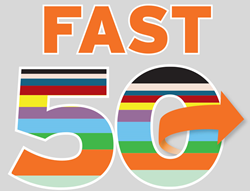 A huge congratulations to all of the companies on the Fast Fifty list! Maven Wave is honored to be included on this prestigious list. View the full article in Crain’s Chicago Business. Maven Wave is a hybrid of the experience you get from top-tier consulting and the agility you’d expect from a cutting-edge technology firm. Our solutions capitalize on the evolution of digital technology trends that are social, mobile, rooted in analytics, and built in the cloud.